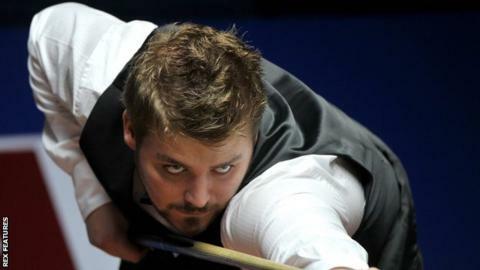 Michael White is confident he can win the World Snooker Championship, which starts in Sheffield on Saturday. After beating John Higgins during the Welsh Open in February, White was tipped as a future world champion by Ronnie O'Sullivan. Mark Allen thrashed White 5-0 in the quarter-finals that followed. But 24-year-old White said: "I think I'm a dangerous outsider. I'm up for anything that's thrown at me. I believe I can go all the way." White cites the Higgins scalp as a reason for him to be confident at The Crucible. "I'm definitely capable of those performances on a more regular basis," said White. "It's just a matter of me believing, which I am, and maturing, which I am as well." Having risen into the World's top 16, White has qualified automatically for the World Championships and was "absolutely thrilled" to avoid the pitfalls of three qualifying rounds. At his first attempt in 2013 he reached the quarter-finals after beating fellow Welshman and two-time world champion Mark Williams in the first round. In 2014 he was edged out 10-9 by the eventual champion Mark Selby in the first round before failing to qualify in 2015. White will start his first round match against England's Sam Baird - who qualified for the Championship - on Sunday evening at 19:00 BST. Baird beat White 4-2 the last time they faced each other at the Gdynia Open in Poland in February, but the Welshman says that defeat will not be a factor at The Crucible. "That'll have no bearing on our match here over the best of 19 frames," said White. "He played very well to beat me. He's a dangerous player. I wasn't surprised when he came through the qualifiers, but I'm pretty confident that if I play well that I'll come out on top." White says O'Sullivan's comments in February about his potential were a huge boost as he bids to become the first Welsh world champion since Williams in 2003. "It meant a lot to me for Ronnie to say that," said White. "I class him as the greatest player that's ever played. I've got to dedicate myself to be the best I can. I think I'm on the right track. I'm well prepared."